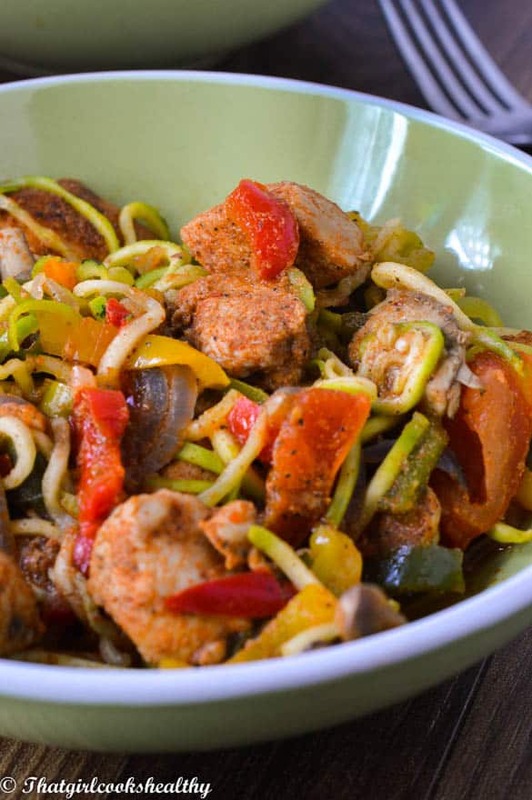 Cajun chicken zoodles – a spicy paleo recipe where chicken breast is tossed in cajun seasoned and cooked with grain free zucchini noodles. Cajun chicken zoodles is my absolute go to meal right now. Last Christmas I received a spiraliser and since then we have become well acquainted. I will do a review about the spiraliser and how it aids my gluten free lifestyle in the upcoming weeks. I’m sure you are probably wondering why I haven’t written in great detail about the wonderful benefits of owning a spiraliser? Well the main reason behind not going into a complete dialogue about it was simply because I wanted to assess the performance throughout the year, observe the pro’s and cons in order to provide my readers with impartial feedback. Now let me alleviate some of my excitement to talk about this southern US inspired dish. I’m sure you all are familiar with the term zoodles by now. If not, that’s fine as I’m happy to explain where the name derives from. 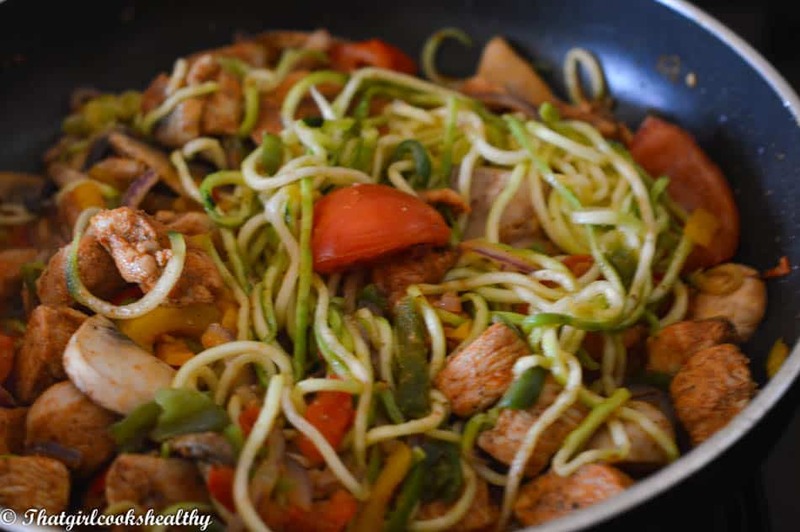 Zoodles are grain free noodles made from zucchini, Brits refer to this vegetable as courgette but I quite like the name ‘zoodles’ – it sounds rather trendy. 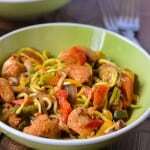 Cajun chicken zoodles are spicy!! I really hope you guys are fans of spicy food because this meal will have you reaching for a glass of milk to cool off that heat. I love southern cooking and soul food. Some of the recipes and method of cooking is similar to the Caribbean, that’s due in part to the African influence that we share as a collective. 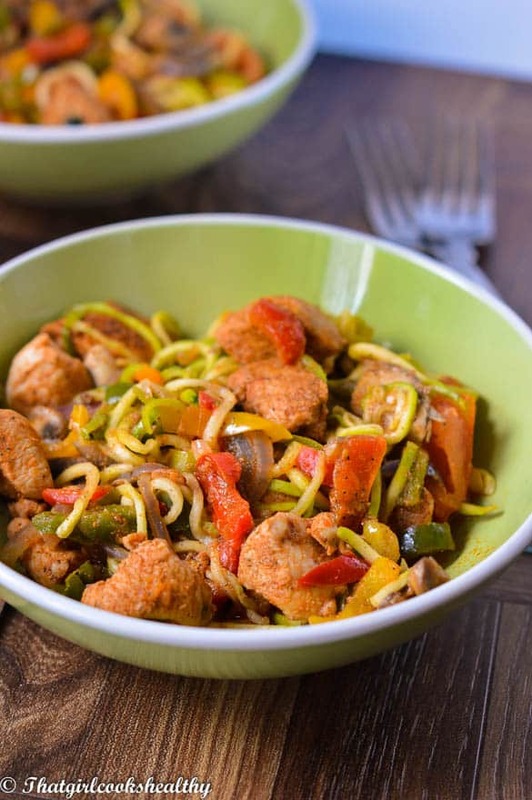 This spicy cajun chicken zoodles dish won’t take very long to prepare, once the veggies are cut into small pieces. You will need to prep the chicken with the Cajun seasoning which I will give you ingredients for further down in the post. As mentioned a few times in my posts, I’m a huge fan of leaving my meat to absorb their flavours overnight, on a much deeper level. This is an optional yet highly recommended step and I do appreciate that time maybe against you. In contrast to my recommendation feel free to allow the dry rub to penetrate the meat for several hours (3-4 hours). 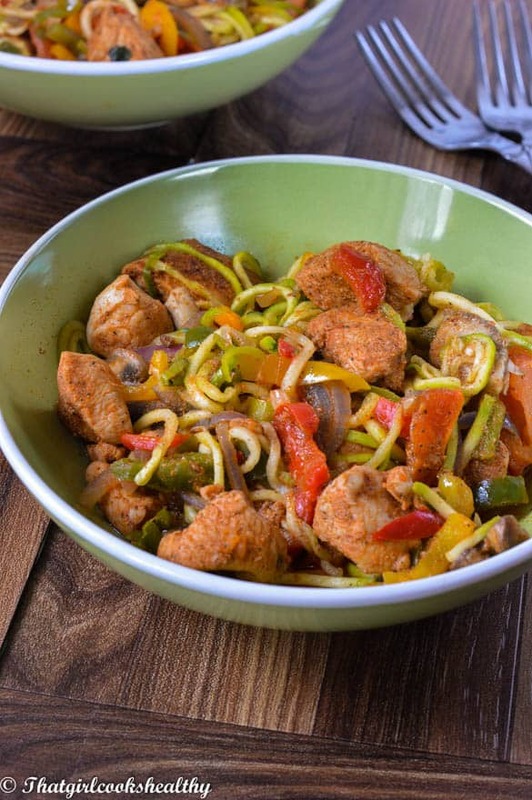 I have no idea if the results for this cajun chicken zoodles recipe will differ as this is not something I’ve tried, I highly doubt there would be a huge difference – the flavours may not be as intense, at a guess. add to a coffee blender and grind into a fine meal. Once the seasoning is ready, rub a generous amount into the chicken, roughly 2tbsp worth of the mixture. Fast forward past the prep stage and let’s get right into the cooking process. The zucchini needs to form into grain free noodles using the spiraliser and sprinkled with some pink salt to remove the bitterness. 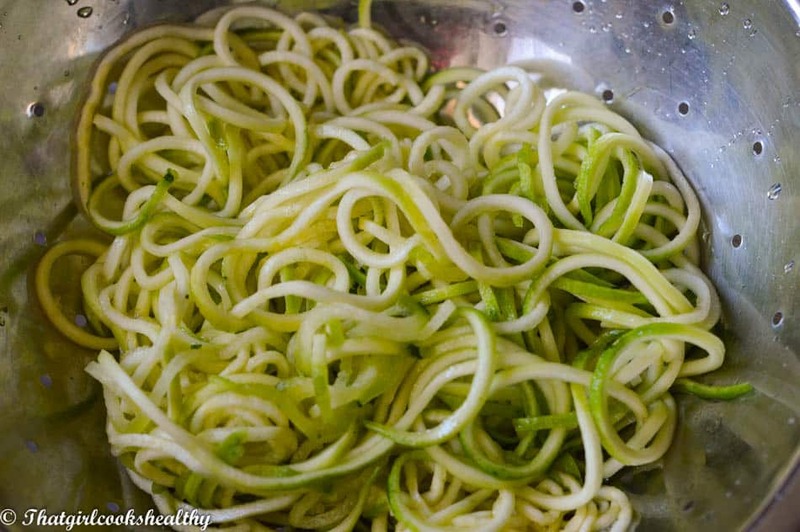 Leave the zoodles in a colander to sweat for 10 minutes, then rinse off the excess salt and water. Meanwhile, brown the chicken in a heavy duty frying water. I like to cook with a small amount of coconut oil – it has many amazing properties and it’s a healthy fat with a very high smoke point – browning should take 5-7 minutes in total. Next, add the red onions and mixed peppers first and sauté until tender. In bid to prevent the mushrooms, tomatoes and zoodles not to over wilt, add those at the tail end of cooking. Finally add the remaining ingredients and carefully fold in with the chicken, peppers and red onion. Feel free to spice things up with additional Cajun seasoning or salt and pepper. Although the given amount should suffice already. 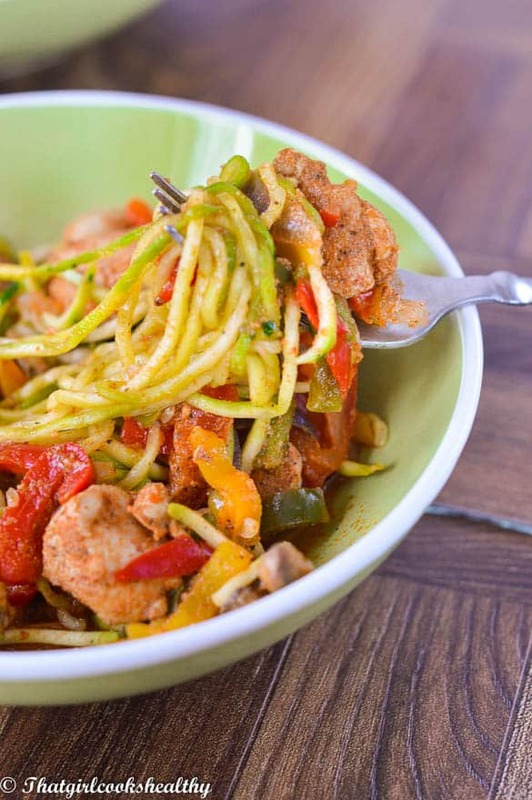 These fool proof cajun chicek zoodles will have you yearning for seconds, don’t believe me? Go on and try it. Prep the zucchini with the spiraliser, once the zoodles are formed, add to a colander with 1tsp of pink salt and set aside to sweat for 10 minutes then rinse with water, drain and blot with kitchen towel. 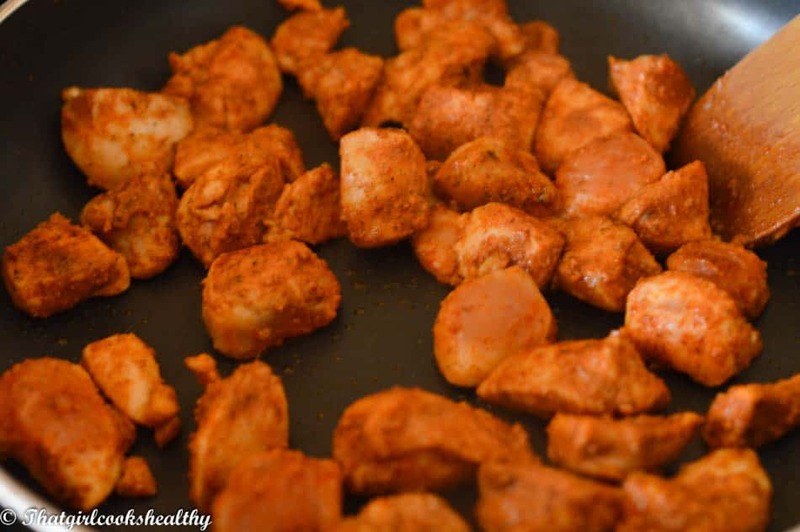 Add the melted coconut oil to a medium sized heavy duty frying pan and begin to brown the chicken pieces on low-medium heat for 5-7 minutes. 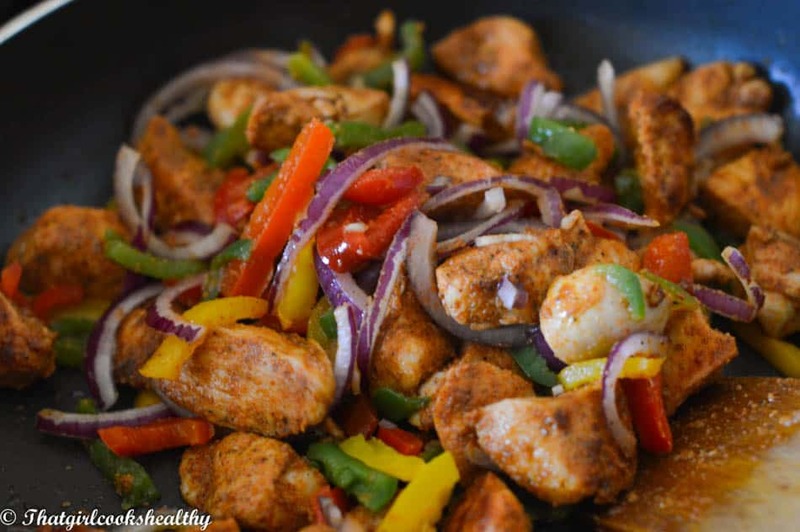 Once the chicken has darkened, add the red onions with the red, yellow and green peppers to the pan – sauté, toss and shake the pan frequently. The onions and peppers should tenderise within 3- 4 minutes, at this stage add the mushrooms, tomato and zoodles – in that order and fold in with the chicken and veggies. Sprinkle more salt, pepper and Cajun seasoning if needed. Allow the mushroom, tomato and zoodles to soften in the pan. This will take approximately 2 minutes, be careful not to over wilt. The excess water from the zoodles will form a light sauce to drizzle upon serving. Prep time excludes the dry rub infusion, total cooking time will vary accordingly to same day or overnight seasoning of the chicken. « Why is organic food considered better for us? This Website has nice information and pictures that will make people hungry. Zoodles? Well, that’s different. Now I have alternatives to store bought, expensive organic spinach//beet pastas. SInce I have yet to find sprouted pastas in my area. I can’t wait for your review on the spiralizer. Yes, I was overjoyed once I discovered zoodles made using a spiraliser. You don’t have to worry about marinating the chicken for a long period of time I did mine for an hour and very spicy. I like spicy but this was way way to much. So I added water to wash Off most of the spice scooped the water out and salted and buttered my dish and it was delicious. Hi Maryanne, thank you for providing some feedback on the recipe. Yes it is quite hot but I’m glad you were able to tailor the recipe to your enjoyment :).